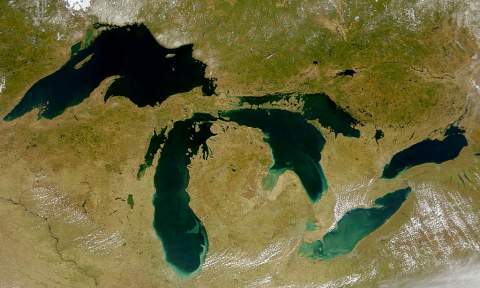 The Great Lakes hold 20 percent of the world’s fresh surface water. The good news is that legacy contaminants are decreasing more quickly than previously reported in three of the Great Lakes, but have stayed virtually the same in two other lakes, according to new research. Polychlorinated biphenyls (PCBs), the pesticide DDT and other banned compounds dropped about 50 percent in fish in Lakes Michigan, Ontario and Huron from 1999 through 2009, although there were no significant changes in Lakes Superior and Erie fish, according to the study to be published this month in Science of the Total Environment. “These are very positive results. The lakes are improving and slowly cleaning themselves up,” said Thomas Holsen, co-director of Clarkston University’s Center for the Environment and co-author of the study. “Even with the decreases, it will be 20 to 30 years until the decades-old contaminants in Great Lakes fish decline to the point that consumption advisories can be eliminated,” Holsen said. This destructive activity is a prime example of governments’ tunnel vision. Oil and gas development moves forward, cleanup of the lakes moves forward, air deposited of chemicals from many sources continues. It’s like shoveling the sidewalk in a blizzard, it won’t be cleaned until the snow stops falling. There is no sign of the chemical blizzards retreat.I grew up near the lakes in Buffalo and understand their beauty and value. My sister and brother-in-law were active in advocating the cleanup of the lakes in the 1970’s. Our family vacationed on the lakes. It was exciting back then to hear that a serious effort from both sides of the boarder would advance to make the lakes swimmable, the fish safe enough to eat and so many other promises. Now more than 35 years later reports are praising the cleanup of historical chemical deposits while at the same time new chemicals are allowed to enter the lakes without protest.